You're in the right place to write a great medical assistant resume. As a medical assistant, you'll get valuable clinical experience. You'll interact with patients. Learn assessments. You'll go home every day knowing you've made a difference in someone's life. That stack of 300+ medical assistant resumes. It's so high the HR manager can barely see over it. But don't worry. I'm about to teach you to write a medical assistant resume that stands out like Dr.
McCoy in a Walmart colds & flu aisle. A medical assistant resume example better than 9 out of 10 other resumes. How to write a medical assistant resume that will land you more interviews. Tips and examples of how to put skills and achievements on a medical assistant resume. How to describe your experience on a resume for a medical assistant to get any job you want. 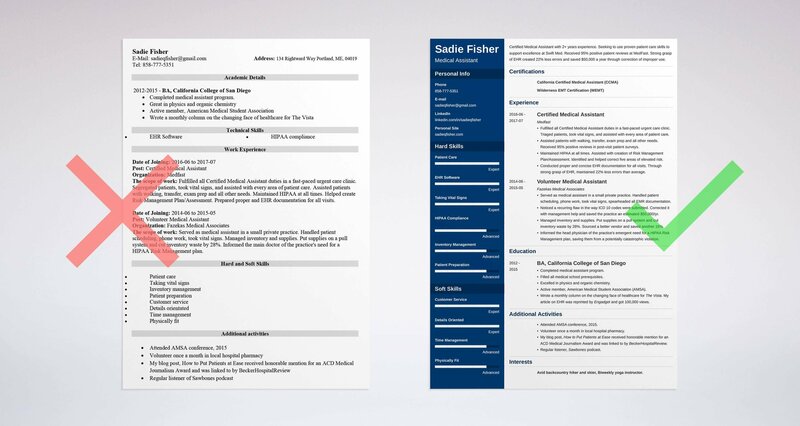 Here's a sample resume for a medical assistant made using our resume builder. Medical Assistant Resume Example - See 20+ resume templates and create your resume here. What’s the Best Format for a Medical Assistant Resume? Here's a scary thought: The average HR manager spends six seconds looking at each resume. That means your resume has got to shine. A professional medical assistant resume will get attention like Dr. Oz, without looking needy. Use a the reverse-chronological format for your MA resume. That format shows your best achievements first. Need an example? Check out the sample medical assistant resume template above. Notice that it uses lots of white space, legible fonts, and big, friendly headings. Save your resume as a .pdf. A .pdf preserves the formatting. Tip: Check the job posting to make sure the company doesn't prohibit resumes saved in that format first. What about the best entry-level medical assistant resume format? Some job experts say entry-level candidates must use the functional resume format. We disagree. The functional resume format works best for those with no experience. As you'll see, you should never turn in a resume with no experience. Pro Tip: Less is more. One recruiter says most resumes she sees are two pages. The ones that get the interview? One page only. Not sold on the reverse-chronological medical assistant resume format? See our guide: "3 Resume Formats: How to Choose the Best One [Examples]"
Should You Use a Medical Assistant Resume Summary or a Resume Objective? Which will make the HR manager see you as the next Christiaan Barnard? A resume objective or a resume summary? A resume summary is for applicants with mountains of experience. A resume objective is for anyone without. It works for entry-level medical assistant resumes, or anybody seeking a new niche. Here’s a sample medical assistant resume summary. See how it focuses on details? Certified Medical Assistant with 5+ years experience. Seeking to use proven patient care skills to support excellence at Swift Med. Received 95% positive patient reviews at MedFast. Strong grasp of EHR created 22% less errors and saved $50,000 a year through correction of improper use. Experienced medical assistant with skills in patient care, administering injections, prepping patients, scheduling. Compassionate and details-oriented. Next, look at this medical assistant resume objective for an entry-level candidate. It's best for applicants with no experience, or someone seeking a new niche. No medical assistant experience yet but I'm eager to get some on-the-job training. That first sample will make even an entry-level medical assistant resume stand out like Doogie Howser in a nursing home. The second? Not so much. Pro Tip: Focus your healthcare resume objective on the benefit you'll provide. "I need a job" sounds empty next to, "I want to double your level of patient trust." For medical assistant resume tips for your resume or objective, see these guides: "How To Write A Resume Summary: 21 Best Examples You Will See" AND "The Only Way to Use Resume Objectives [20+ Examples & Tips]"
The hiring manager just hit "delete." She trashed your great medical assistant resume! She didn't see your certification. Notice that we put "CMA" first, but added other relevant certifications. For more examples, see the sample medical assistant resume at the top of this guide. Pro Tip: You don't necessarily have to pay for an expensive medical assistant training program. Some states let you challenge the test based on prior work experience. In some areas, you can challenge the CMA exam through the NCCT or the NHA, but not the AAMA. Want a bit more advice for showing certifications on your resume? See our guide: "How to List Certifications on a Resume: Guide +20 Examples"
"Wow. Let's interview this one." Your certified medical assistant resume experience must make the hiring manager say the words above. List your most recent job first. Add 4-6 achievements and medical assistant responsibilities. Then move on to the next job. Custom-fit your bullet points to the offer like a new heart valve to a patient. List all the most important requirements. Those are the foundation for your resume. Let's take a doctor's assistant job opening. It values speed, taking vital signs, patient interaction, HIPAA, and EHR. Fulfilled all Certified Medical Assistant duties in a fast-paced urgent care clinic. Triaged patients, took vital signs, and assisted with every area of patient care. Assisted patients with walking, transfer, exam prep and all other needs. Received 95% positive reviews in post-visit patient surveys. Maintained HIPAA at all times. Assisted with creation of Risk Management Plan/Assessment. Identified and helped correct five areas of elevated risk. Conducted proper and concise EHR documentation for all visits. Through strong grasp of EHR, maintained 22% less errors than average. Worked as medical assistant. Triaged patients, helped with lab work. Responsible for patient care. Assisted with transportation. Assisted with documentation of patient visits. Conducted specimen collection. The first senior medical assistant resume sample shows the right skills. The second misses like a phlebotomy needle on a rolling vein. The good news is, it's easy to get medical assistant experience. Doctors offices always need help. Offer to train on the job. Volunteer to work for free. Even a week or two of volunteering looks great on a resume. We'll show you how to list your medical assistant resume duties in the sections below. Pro Tip: If you did an externship, list it just like work experience. Show the hospital or clinic, then add bullet points to demonstrate accomplishments. Need more examples to make the best medical assistant resume you can? See our guides: "Internship Resume for College Students: Complete Guide [+20 Examples]" AND "Complete Guide to Writing a Student Resume [13 Tips, Examples]"
You've got "no experience" for your professional medical assistant resume. Served as medical assistant in a small private practice. Handled patient scheduling, phone work, took vital signs, spearheaded all EMR documentation. Noticed a recurring flaw in the way ICD 10 codes were submitted. Corrected it with management help and saved the practice an estimated $50,000/yr. Managed inventory and supplies. Sourced a better vendor and saved 15%. Assisted with the creation of a HIPAA Risk Management plan. I don't have any medical assistant experience yet but I'm a fast learner. Putting volunteer work (or an externship) in your healthcare resume can impress the hiring manager. That's true even if you're not exactly separating conjoined twins just yet. Pro Tip: Don't have an externship for your great medical assisting resume? Don't panic. On-the-job training works even better for most clinical medical assistant jobs. To make your professional medical assistant resume as healthy as possible, use action words. Want some? See our guide: "80 Examples of Resume Action Words for Every Profession"
Not every medical assistant needs to take a formal program. So you can phone in your education section from the golf course. Right? Of course you know, the answer's "no." It's true you don't need a medical assistant program to get a job. In some states you can do on-the-job training and challenge the test. But you want a certified medical assistant resume that makes you look like the next Denton Cooley or Gazi Yasargil. That means you need to pay attention to your education section. Filled all medical school prerequisites. Excelled in physics and organic chemistry. Active member, American Medical Student Association (AMSA). Wrote a monthly column on the changing face of healthcare for "The Vista." My article on EHR was reprinted by Engadget and got 100,000 views. So you finished your MA resume. It's got a lot of white space. Feeling a bit like Dr. Hibbert from the Simpsons? Get that resume into remission with some simple changes to your education section. Add your GPA if it's higher than 3.7. Highlight areas of study where you excelled. Tout student associations and other extracurricular activities. Just adding kudos and achievements to your education section can make even a student medical assistant resume glitter. Pro Tip: Wondering whether to add a detail? Ask yourself if it shows you fit the job description in some way. If not, toss it in the biohazard bin. 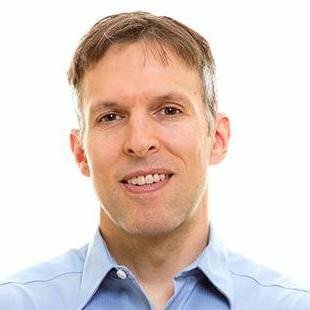 Want more examples to write the best resume education section you can? See this guide: "How to Put Your Education on a Resume [Tips & Examples]"
Your medical skills will get you hired. That tired HR manager will see them and have palpitations. What the hiring manager really wants to know is, do you have the skills she needs? And can you prove it in your professional medical assistant resume? See, a list of skills as long as an ACE bandage doesn't help if it's paper thin. So, list your medical assistant skills that match this job description. Then, back them up in your experience and education sections as accomplishments. Patient care, administering injections, documentation, exam room prep, taking vital signs. Exceptionally skilled at EHR software and ICD 10 Code entry. Strong medical inventory management skills. Deep understanding of HIPAA compliance and Risk Management Plans. Compassionate, detail-oriented, with good customer service and time management skills. One good use of skills? They make great medical assisting resume keywords. Recruiters use software to find the resumes they're looking for. Find out what keywords the hiring manager wants by peeking in the job posting. Use the medical assistant skills keywords below to get a good head start. Need more medical assistant skills to list on your resume? Search through job offers on LinkedIn and other job boards. Pro Tip: One big skill for medical assistants is EHR or EMR. They both mean the same thing, so put each somewhere in your resume. 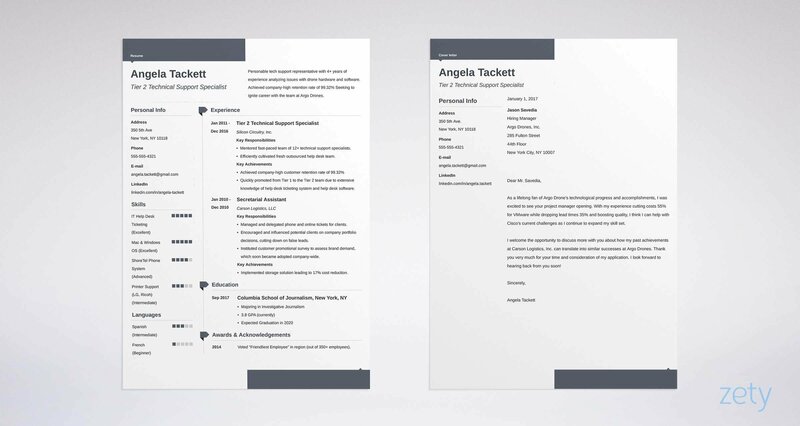 See the sample resume up top for an example. Want more advice for how to add skills to the best medical assistant resume? See our guide: "30 Best Examples of What Skills to Put on a Resume (Proven Tips)"
Want your resume to look like all the others? So, add sections for awards, hobbies, or passions. Are you in med school? Have you published articles? Been to conferences? Are you an EMT? Anything that shows your passion for all things medical is fair game for medical resumes. Volunteer work shows you're service-minded. Groups or sports prove you're a team player. Here are two professional medical assistant resume samples. My blog post, How to Put Patients at Ease received honorable mention for an ACD Medical Journalism Award and was linked to by BeckerHospitalReview. Avid backcountry hiker and skier. I'm extremely excited about Game of Thrones. For a good rule of thumb, ask, "What are the duties of a medical assistant?" If your "other" information shows you can till those duties, add it to your resume. Pro Tip: Don't have "other" info? Build some. Do a couple days of volunteering or job shadowing. Write an article or attend a conference. Want some inspiration for the "other" sections of your great medical assistant resume? See this guide: "20 Best Examples of Hobbies & Interests To Put on a Resume (5 Tips)"
It's easy to put contact info on a medical assistant resume. These days, you'll also need your LinkedIn handle, Twitter, and a personal website if you have one. That way, a curious manager can see you're more than just a sheet of paper. Pro Tip: Show your best side on LinkedIn by optimizing your profile to really nail your job search. See our article on LinkedIn profile optimization here. Need more help with knowing how to write the best medical assistant resume? See our guide: "How to Make a Resume: A Step-by-Step Guide (+30 Examples)"
Put that one right up there with the Minotaur and Zeus' headaches turning into offspring. 60% of hiring managers don't read cover letters. The rest consider them essential. To write the best cover letter for your medical assistant resume, make it personal. Read up on the company, the job offer, and the HR manager. Then tailor your cover letter to match that knowledge. Don't toot your own horn. Instead, troll your resume for high points to catch the hiring manager's attention. Use the manager's name. Mention a detail you like about the hospital or clinic. Then use your achievements to show how you can help. Do this, and you'll stand out like you invented scrubs. Want to really nail that medical assistant cover letter? See our guide: "How To Write A Cover Letter [Complete Guide With Examples]"
Inject life into your experience section with achievements or volunteer work. A medical assistant resume with no experience may as well be on life support. Custom fit your resume to the job description. Make every bullet point fit a skill or requirement in the posting. See the medical assistant resume sample up top for help. Add "other" sections that highlight your verifiable wins and best assets. Finally, send a cover letter, and follow up. You want your resume to show you as a human being, not a sheet of paper. Got questions on how to make the best medical resume or lab assistant resume? Give us a shout in the comments section!